Thank you so much for the most incredible party yesterday! All the boys absolutely loved it and I’ve never hosted such an easy party for 20 kids before. Your energy, enthusiasm, attention to detail and supreme flexibility made it an absolute breeze for us and the boys had a whale of a time. I massively appreciate your professionalism and help arranging every detail. Im so sorry it has taken me so long to message you. Christmas took over and then I went on hols etc. I just wanted to email and thank you for putting on an awesome party for Lucas back in December. He had such a fab time and said it was his best party yet! You were a brilliant host and the kids all had such a blast. I thought your set up was great too. I have already recommended you to others. Wishing you a good 2019 and thanks again. Huge thank you for today the children had a great time. You are absolutely fantastic at what you do – highly entertaining, I love all the finishing touches and dramas and jokes around presentations/awards. As I said you have a great reputation, you’ve been recommended by friends and we shan’t hesitate to sing your praises to any mums of potential birthday Nerfers….. or with husbands with milestone birthdays coming up! With best wishes and have fun Nerfing. Being new to the East Sussex area, we were looking for a laser party for our son Alex and found you via Google. From the moment I first contacted you and received a prompt reply, I knew that the service you offered was going to be as good as you promised on your website! I turned up at our hall at 9am to find your van already parked and you and Ben already getting stuck into setting up. Delighted with your excellent communication, promptness and professionalism at all times during the planning process. Then the party itself – nothing short of AWESOME! The kids all absolutely loved it, you both have a natural way with children making the whole experience fun yet safe. In fact I was impressed by the emphasis you placed on wearing goggles and ensuring the children were adhering to the rules. Alex told me it was the best party ever, and the emails have been pouring in from the other parents too! 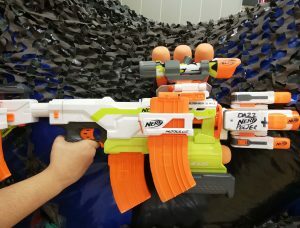 Nerf Rival next year??? 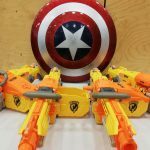 We will be recommending you to our friends and wish you both all the best for your future Nerf parties! Thank you for entertaining us all on Sunday, what a blast we all had, I will never live it down shooting my mum….lol……… well done to you all, you deserve all the accolades and success by what you do to entertain kids and adults alike. Thank you so much for such a fun party on Saturday. The boys had a ball, which is the main thing, and we’ve had such happy and positive feedback. I really appreciate that you were proactive and positive despite our timing issues and so engaged and upbeat with the boys. I’m sure we’ll be in touch for our younger son, or even adults!, in due time. Simple, Best Party ever, we all never thought would would enjoy it this much we booked again as you know. See you in July this year. It was a brilliant party and your crew made it brilliant! Thank you so much for making this Daniel’s “best party that he has ever had”. It will be soooo hard to beat for next year! Thank you also for letting us join in. We could barely move the next day, it’s official – we are old! However, you really were amazing. Thank you again! You and your team were absolutely amazing!! We’ve had numerous families ask for your details because they would like to book a party in the future! Thank you for making our son’s party so special, Leo had an incredible time! Massive thank you Darryl to you and your team for your fantastic contribution to our Mayfair in Groombridge last week. In searing heat you kept hundreds of Groombridge children entertained – it was difficult to see who was having more fun at times – the children or the workers?! I hope you will return next year to entertain us all further and obviously I have booked you for all my son’s parties until he turns 18! That says it all, we now have to come back…………OH GREAT! 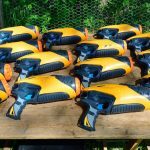 I chatted to you about NERF at last weeks Bank Holiday fun at Groombridge and was truly amazed at the set-up you do………you have to be commended, my sons loved it and will be having their own party with you soon…..they can’t wait. Thanks again for an absolutely awesome party! The kids had so much fun, and your team were excellent. Hope you enjoyed the cupcakes! 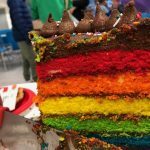 Here’s the rainbow cake picture for you. We really did enjoy the day and I am sure Arthur will want a repeat event next year, so no doubt we will be in touch! Hi Darryl, Just a quick thank you for louies party yesterday. It was absolutely fantastic! More than I could have hoped for. Louie’s cousin had been to a nerf party a few weeks before and said it was great so we were all looking forward to ours, but yesterday she said this one was 10 times better!!!!! I honestly can’t thank you enough, the set up was so professional yet the kids (and adults) have so much fun! You made Louies day! Thanks to you & Ben for a fantastic party yesterday!! Jack had a blast & now we’re talking about ramping it up next year! Thank you for an awesome party today, we’re still buzzing from all the fun and games. We’ve been raving about you guys to everyone this afternoon. Here’s to many more party’s together. We’re on the case with organising one for the parents at school!!! 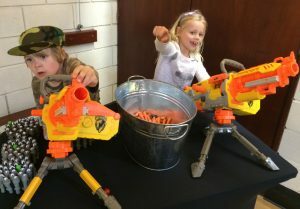 Wanted to say a massive thank you for the fab NERF party you did for Will & Digby. It was a massive success, all the children had a great time, you both have a fun, but firm way with the children, as parents it’s so good to know our children are in safe hands when doing an activity like that. What a party, I cannot thank you enough for taking my nerf crazy kids to heaven and back, you know exactly what they like and do it so well……….truly Mega Party. 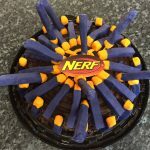 I am writing this review (I never do reviews) as I feel these boys (Darryl & Ben) need to be praised in the highest regard due to the sheer effort they put in to make my two son’s NERF birthday Parties the best ever, they had the time of their lives. Never mind the equipment they hold in their armouries which is quite unbelievable for both types of NERF party, we have done both now. If you put the effort in you get the results and quite simply they are the best at what they do and have the kit to take my children to heaven and back. Well, well done we just have to come back again and have another go…………soon. Hi, I thought I would just send you a quick message to say two words, ‘Totally Awesome’ and this is what my 8 year old son Marcus said………..he is still on cloud 9 except all his NERF stuff is in his bed thanks to you lot……….I did laugh. This has to go down in history as the best party ever as my son is so NERFED up he is in heaven and it looks like you will be seeing more of us until he grows out of it…..WHEN! Well done to you all in coping with 25 kids, you need medals. 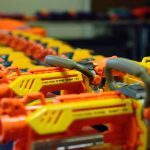 “This month (15 September 2017) Darryl Curcher of Mega Blaster World led a large Nerf event on school premises involving over 200 Year seven and eight children (aged 11-13). The event was very safely run with multiple marshalls and compulsory safety glasses/goggles worn by all involved. It was an excellent fundraiser, raising a considerable amount of profit for us, and one that the girls thoroughly enjoyed. There were no injuries to anyone’s eyes and we will be looking to have similar events in the future. Just a note to say a big thank you to you and Ben for yesterday’s party! The kids all really enjoyed it, and Andrew and I felt you both had total control, and a great mix of “rules & fun”! I have hosted a good number of kids parties over the years, with a variety of party entertainers and activities, but we honestly think that you and Ben come tops for performance and delivery from start to finish! Will definitely be recommending you, and hope to book you again in the future …. But maybe not just for the kids next time!! I have to say this was the best party we have ever had for our children, even Milly had a go and she hates NERF and now somehow loves it!! The time you spent explaining and helping all the children to understand how everything works simply has to be commended as I would have given up a long time ago. Both your enthusiasm, passion and drive to give the children the best time ever is why this type of party is priceless in our eyes…………….bringing safe fun to the masses with a smile, exceptional, well done and thanks for the entertainment. Just wanted to say thank you, to you and your team for the party we had for Daniel. Daniel had the most amazing time, all of the children have said ‘it was the best party ever’. Daniel has already said can we do the same for his next birthday. I will be recommending Mega Blast World to all my friends. An enormous thanks for Saturday – I am recommending you to everyone! I can’t believe I can actually say that I enjoyed a children’s party – that is because all I had to do was sit and drink wine! The NERF theme continued through Sunday before Oscar got very sad that it was all over – the signs of an amazing party! You and Ben couldn’t have been more enthusiastic or helpful. Thank you, we really appreciate all your energy and passion- it was clear to see! A party that Luke will not forget. Just wanted to say a big thank you for the party on Friday. Evan and his friends had a brilliant time! Thank you also for all your help setting up the hall and of course for Evan’s Nerf gun – which, incidentally, he has only let go of when he is asleep!! Highly recommended venue! We had a double birthday party for 5 and 9 year olds in October 2014. 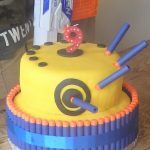 The birthday boys and all the guests from adults to children could take part in a mega nerf gun play. It was a huge success. Thanks Darryl and the team for your effort and great energy. We will be back! A quick line to say that Chris’ party on Sunday was a hit with all the kids. 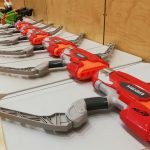 The organisation and delivery was excellent, and the kids really enjoyed the opportunity to swap weapons during the course of the various battles. Both staff worked really hard to make the party a great experience, and more than a few adults enjoyed the opportunity to get involved! 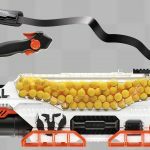 The Nerf approach is far better that Laser guns because it is more tactile, but without the disadvantages of paintball. So, thank you for a great party! Hello there! Just wanted to say a massive thank you for the.. I’ll quote my son “epic party” the kids and adults had a fantastic time. Well done to you both for making it so memorable! Just want to thank you and your team for making yesterday a fantastic birthday party for the boys – William and Monty – all the children had a fantastic time. I will be recommending you to any friends who want to have a Nerf gun party. Good luck in your new venue. Thank you so much for the party today. Everyone had such a great time and Zak kept saying that whole way home how ‘awesome’ it was! You guys a brilliant, perfect for the job. 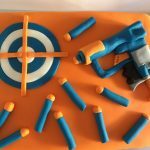 He’s a picture of our cake for what it’s worth, not exactly a work of art or homemade but nerf cake it is! Thank you for a fantastic birthday experience – all the children had a great time. Thank you very much for Woody’s party yesterday and sorry I don’t manage to say goodbye – I thought you guys were going to come in the courtyard for a drink after. The kids all had a fabulous time, Thank you for making it so much fun. We will definitely see you down at Groombridge soon. Sorry I haven’t had a chance to email you. I just wanted to say a HUGE thank you for making Teddy Party amazing! You both done such an amazing job and the kids & the parents loved every second of it. I think you’ll be hearing from a mum from the school shortly to arrange another party! Just wanted to say a huge thank you to yourself and Ben for a great party on Saturday. The children all had a wonderful time and so did Michael and I!! Hopefully see you at Groombridge Place in the summer holidays. 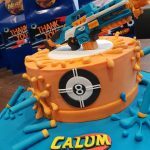 My son had his 9th birthday party at the Mega Blaster Arena last week and what a fantastic time everyone had. 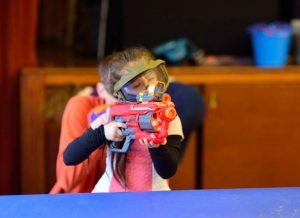 On arrival the children were shown how to operate the Nerf guns and were allowed to choose whatever gun they wanted from a wide range.They were all given protective eye wear before entering the arena. They then had an hour of free play, 15 minutes of organised games, finishing with another 15 minutes of free play. We will definitely be visiting again over the summer holidays and I hear its moved to Groombridge Place, even better, would highly recommend it to anyone. 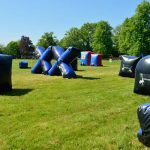 What an amazing asset Groombridge Place now has, My partner and our two children absolutely loved the Nerf Arena, showing that it is not just for children!! The staff are welcoming and are always on hand if assistance is required. 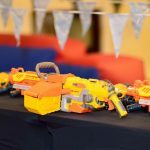 My two children were allowed to choose their own Nerf gun, they were shown how to use them and could swap if they wanted to try something different as they were spoilt for choice with the vast amount of nerf guns on offer! Would definitely recommend to others! A safe and fun way to entertain your children for half an hour! We booked a birthday party at the Mega Blaster Arena and we were absolutely delighted. The kids (and adults) had an amazing time; Darryl and his team make the whole experience so easy and so much fun. We can’t recommend the venue, the experience and people enough. Fantastic. P.S. I hear it’s moved to Groombridge Place, even better! 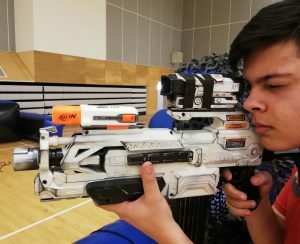 After visiting the new Mega Blaster Arena I had to take my Nerf gun obsessed son along to try it out, and we were not disappointed! Me and my partner did not intend on joining the session but got encouraged to take part and we are so glad we did, the three of us had an amazing time! 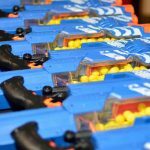 The staff are friendly and helpful and the arena has a large selection of Nerf guns to choose so you can try a variety of the guns out. 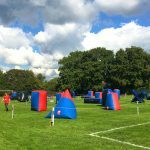 When we arrived we found that there is a new Super Soaker Arena with Nerf water pistols which sounded like great fun on a hot day! We will definitely be booking the Mega Blaster Arena for a party. The highlight of the Day was The Mega Blaster Area where the kids had almost an hour with a huge selection of Nerf guns in a play area (well supervised). Edward has not stopped talking about the Blasters, the arena, the games, the fun and all those blasters dad, you guys are quite simply NERF World, well, in his his eyes you are, well done. ‘Totally “epic” dad….. “the best party we have ever had”………can we do it again! What a party, quite simply amazing….my sons were elated. To be honest I had reservations about doing something like this as my husband said lets save a couple of hundred quid and do it ourselves…..I am glad I trusted you, your enthusiasm to bring us a unforgettable day for our boys. There are so many oh so rubbish NERF organisers on the web, I know that now but what you say on your website you do and your website is so inspiring and exciting so we picked you. For that reason alone I would recommend you to anyone and everyone if your children love NERF like ours do but after the actual party I would tell the world. The best party ever! Well organised, an awesome arsenal of weapons, great games for the kids and the parents got to get involved too. Dan, Billy, Simone and reluctant mum Hannah! Thank you SO much for yesterday there were 17 extremely happy, sweaty and tired children (and two very happy dads!). The children had a blast and you were both brilliant with them all and made what could have been absolute carnage absolute fun, so thank you so much! Hi Guys, what can I say, that’s the best £300 we have ever spent on a children’s party and I just did not expect such fun from shooting darts at one another………..my son say’s it was his highlight of the year, awesome mum he keeps saying and with it being such an awkward year for us I can’t recommend you all enough. The Best Kids’ Party EVER? Phew! What a party! (I’m still recovering now!) Everyone had an amazing time, the birthday boy, of course, and his sister and brother, they haven’t stopped talking about it! Thank you to both you and Ben, for doing such a fantastic job, welcoming us so warmly and for making Harry’s party so special, with such fun memories, for us all!! We’ll look forward to seeing you both again in the future! Thanks for making it an enjoyable NERF party for Zac…. they all had big grins on their faces at the end… Another successful organised nerf games party. Hats off to you. Thanks very much again for a fantastic party on Friday – so many messages from parents of boys saying how much fun they’d had! Just wanted to say a massive thank you for a fantastic party this morning! Jacob had an amazing time, as did his friends and Dad!! It completely exceeded our expectations and we will happily recommend you (not that it sounds like you need it!). Steve and I also both said what a thoroughly nice guy your are, genuine, professional and accommodating. Huge thanks. Many thanks for Sunday. A great time was had by all. You’ve got a good team of guys there, very polite and professional, it was a pleasure meeting them.